This mushroom risotto is one of those special dishes that when prepared with an abundance of love and care, makes for an exquisitely comforting and delicious meal that simply makes you feel cozy. There are certain dishes that have a wonderful way of containing within them a lot of love and nurture. These meals are the ones that often times require a little bit of extra time and tender, loving care, perhaps a bit more attention; and this rich, creamy mushroom risotto recipe is just such a splendid dish. In general, risotto is often times seen as a dish that is difficult to prepare, but the secret is that it truly isn’t. What it does require from the one preparing it is a genuine intention to enjoy the cooking process and take pleasure in the stirring, the simmering, and the aroma of the dish in order for that magic to be tasted. Mushroom risotto becomes extra nourishing when one uses their heart as a guide, and sprinkles in copious amounts of love, patience and intention in order for the end result to be truly pleasurable. 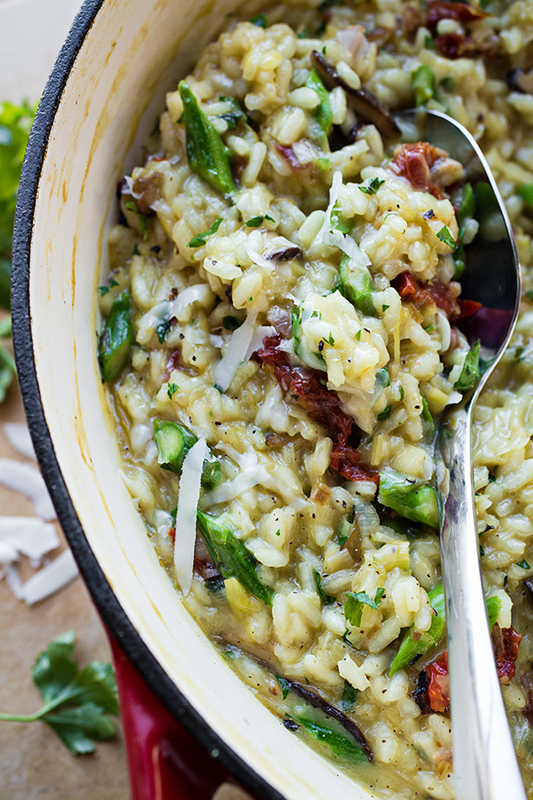 And with tender, seared shiitake mushrooms, some white wine, a bit of vibrant green asparagus, tangy-sweet sun-dried tomato, a hint of bacon and a sprinkle of asiago cheese, this mushroom risotto is a homemade culinary pleasure in which the love can be tasted, indeed. Preparing mushroom risotto is about allowing the layers of flavors to unfold and for a creamy texture to be achieved. After all, isn’t that what’s so comforting and delicious about risotto? 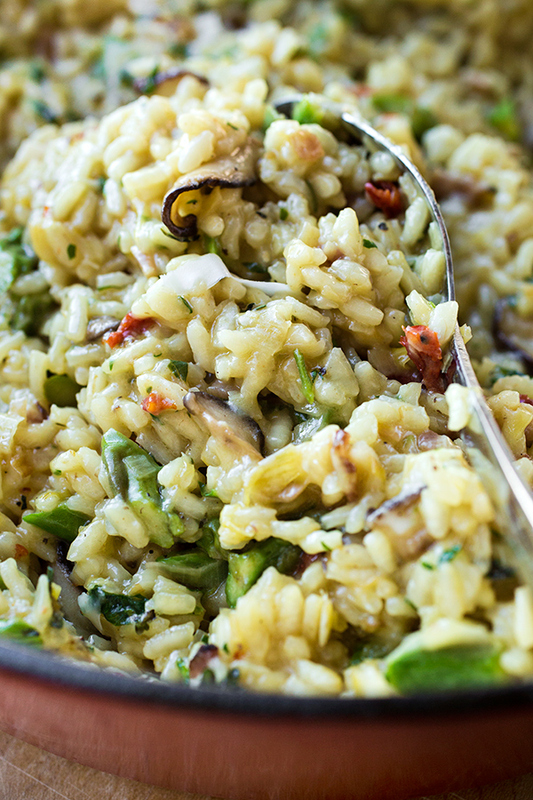 To prepare risotto, one begins by adding some fat and some flavorful aromatics to the pan before adding the rice. Then, the rice is allowed to toast in those rich ingredients before wine is added in for depth and a hint of acidity, followed by small increments of broth or stock in which the Arborio rice (an Italian short grain variety which is higher in starch) is stirred and softened over time creating that delectably creamy texture. To begin, I quickly blanch my asparagus pieces, and cool them in ice water. I sauté my shiitake mushrooms in the pan, the same pan I will be using for my risotto, until they are slightly caramelized and brown. When done, I set those aside. Into that same pan I add some butter and olive oil, then add my leeks and allow those to sweat, followed by some garlic. Next, I add in my arborio rice and stir that into the mixture to coat the grains well, and allow them to toast for about 1 minute. I add in some white wine and allow that to reduce, followed by adding in small ladlefuls of hot chicken broth (or stock), stirring all the while to incorporate it and help the rice to become creamy, until all or most of the stock is gone, about 24-28 minutes. I finish off the mushroom risotto by adding back to the pan the shiitake mushrooms, the asparagus, plus the remaining ingredients, and everything is stirred together until incorporated. Then, I serve while hot, garnished with a touch more asiago cheese over top. Arborio rice for risotto: You will need to use arborio rice for risotto, as it is super starchy and will yield that creamy texture that risotto is known for. You can typically find it in the same section of the market where other rice is sold. Patience is a virtue: While mushroom risotto is not difficult nor complicated to prepare, it does require some patience and some time in order for that cozy, comforting and creamy result to be achieved. Be prepared to stir the risotto the majority of the time, not stepping away from it for too long, as this helps the broth you add to incorporate and the rice to become tender and creamy. 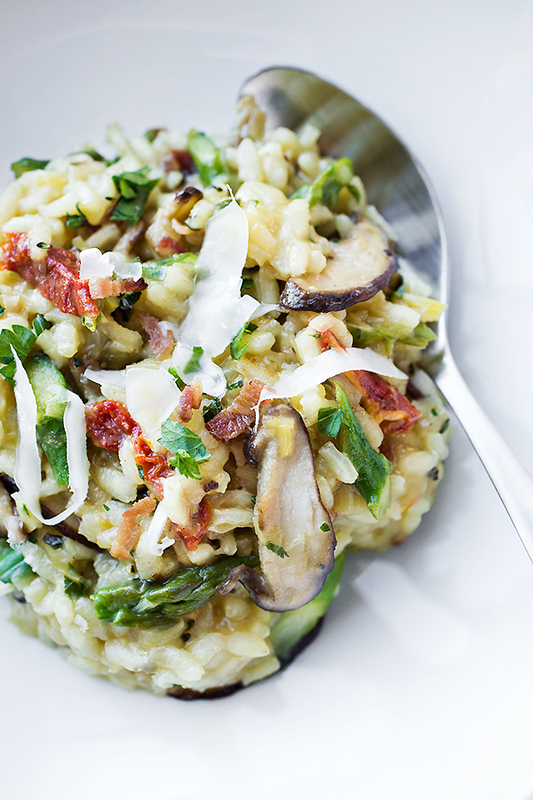 Go vegetarian: You can prepare this mushroom risotto to be vegetarian by simply leaving out the bacon and substituting vegetable broth instead. White wine: Wine is traditional in risotto, and while not very much is used, it does add flavor. Know that the alcohol does indeed burn off, but if you prefer to leave the alcohol out, simply omit it and proceed by adding in the broth. Stir frequently for creamy texture: While you certainly can take breaks after stirring in the increments of broth you will be adding, you will need to gently stir often in order for the rice to begin to break down and soften, and become creamy. Keep things at a very gently simmer: You can’t rush risotto, as it does need time to develop. So once you begin adding your increments of broth (or stock), have the heat on low so that the risotto is always at a nice, gentle simmer rather than too vigorously bubbling or boiling. This mushroom risotto is a delightfully creamy, warm and comforting dish prepared with shiitake mushrooms and filled with lots of love and nurture. -Place a small pot of water over high heat, and add in a liberal amount of salt; bring it to the boil, then turn off the heat and add in the asparagus pieces, and blanch them for about 30-45 seconds; drain, then immediately run the asparagus pieces under ice-cold water, or plunge them into an ice-water bath, and then pat dry; set aside. -Place a large, heavy bottom pan over medium to medium-high heat, and drizzle in about 3-4 tablespoons of oil; once the oil is hot, add in the sliced shiitake mushrooms, plus a pinch of salt and pepper, and saute them for a few minutes until they’re golden-brown; then, remove from pan and set them aside for a moment. -Into that same large pan, add in 2 tablespoons of the butter, plus about 3-4 tablespoons of the oil; next, add in the leeks, plus a small pinch of salt and pepper, and saute them for about 10 minutes, or until they’re caramelized and golden-brown. -Next, add in the garlic, and stir to combine; once the garlic becomes aromatic, add the arborio rice into the pan, and saute that with the leeks and garlic for about 1 minute, in order to “toast” the rice a bit. -Then, add in the wine, and stir to combine; allow the wine to reduce down until it’s almost completely gone, and then add in a couple of ladles of the hot chicken broth (or stock), and stir; reduce your heat to medium-low. -Once the rice has absorbed most of the broth, add in another ladle or two and stir, and repeat the process, stirring the risotto frequently until it becomes tender and creamy, about 24-28 minutes (you will have used most or all of your broth by the end). 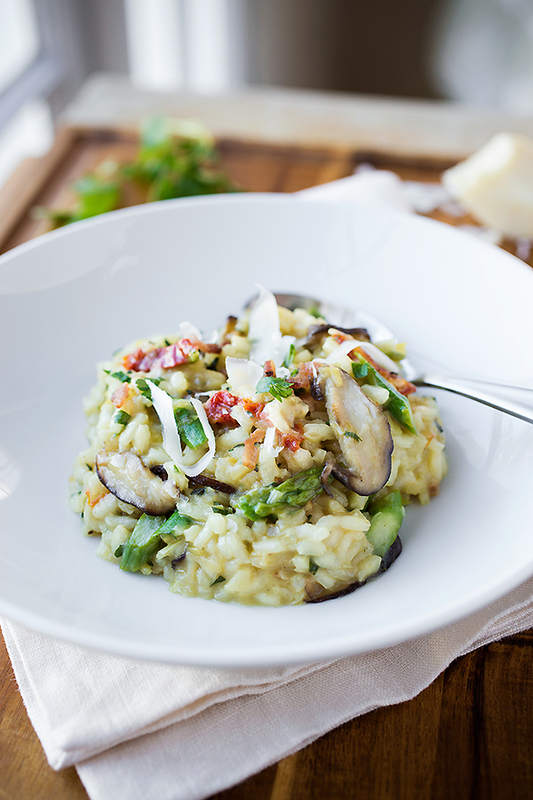 -Once the risotto is finished, turn off the heat; add in about 3/4 cup of the grated asiago cheese and the remaining tablespoon of butter, and stir that in to incorporate and melt; add back into the pan the asparagus, the sauteed mushrooms, the sun-dried tomatoes, the chopped bacon, and the parsley and thyme, and fold those in. -Serve the risotto immediately while creamy and hot, and garnish with some of the remaining grated asiago cheese, if desired. Hungry for more rice recipes? Check out this Roasted Pumpkin Risotto, this Creamy Rice Pudding, this Faux Risotto with Chicken, or this Arroz con Pollo! 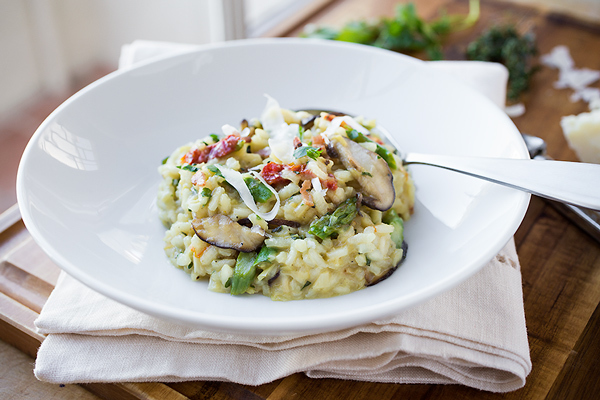 This mushroom risotto looks beautiful! Happy Blog Birthday! The mushroom risotto looks divine. 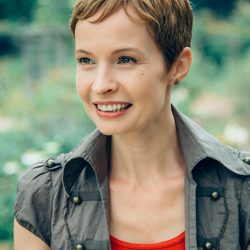 The blogosphere is an amazing journey- so many people, you get to know over the years, and are considered friends. 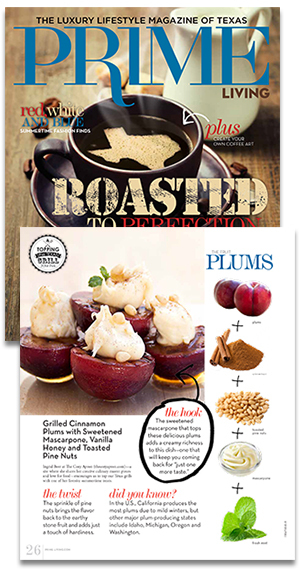 The food community in the blogosphere is wonderful. Hi Lisa, I don’t know that I would recommend it. There are quite a few ingredients (and quantities) that go into the pan to sauté and toast, and they’ll need the oil/butter. You can certainly try and cut back, and always add in more if you see things sticking too much, or that they’re too dry; but risotto, quite frankly, is one of those dishes that needs that butter and oil to get things going for a good end result. Hope you enjoy! This looks absolutely delicious and I can’t wait to try it. Hi Sara, thank you so much! This looks amazing! Will be trying it soon! What wine would you pair with it? I’m trying this recipe tonight for our valentine’s day dinner and I’m so excited! I’ve always loved risotto and this will be my first attempt so wish me luck. I’m planning on pairing it with stuffed chicken breast, do you have any recommendations on what I could stuff the chicken with? I was going to use the extra asparagus and Sundried tomatoes, but I’d love to hear some ideas if you have and by! However, if you want to keep things a bit more simple (because the risotto does need to be “babysat” to be honest), you could always just add some diced grilled chicken breast straight into the risotto at the end, as well. Here’s wishing you success, and a love-filled Valentines! This is absolutely delicious. I will probably omit th bacon next time. For me it was a bit too much. Thank you for sharing! Hi Heather, glad you enjoyed the risotto! And yes, certainly prepare it according to your tastes. Thanks for sharing! This turned out fabulously! Thanks so much for the inspiration. Hi Monroe, so glad to read that! Thank you for sharing. I e made this three times already and it is a bit complicated to do, but oh my GOODNESS SO WORTH IT! I made it for a get together and everybody couldn’t get enough of it and I got so many compliments. My hubby said he doesn’t want to share it ever again so he can keep it for himself. So creamy and rich. Almost a meal by itself. Lovely! Thank you!!!! This is a keeper!!! Hi Celina, so happy to read that! I know, I know…risotto needs to be “nurtured” along during the cooking process, making it a bit of a time-consuming recipe; but when it turns out great, little is quite like it. I smiled when I read the part about your hubby not wanting to share it again—what a precious compliment! Job well done. Is it possible to make this in advance? I’m having a dinner party but do not want to be cooking until right before it’s served. Looks delicious though! Hi Danielle, risotto is one of those dishes that is best prepared just before serving. It is true that it can be done ahead, as many restaurants that serve it sort of “pre” cook it and then finish it to order. You could do this is, and the way to do it is to use additional stock/liquid when you go to reheat it, as it will be very thick. You would slowly and gently reheat it in a large pan, stirring in stock/liquid in increments until the the desired creaminess/texture is obtained. Made this tonight instead of a traditional St. Patrick’s Day feast. So delicious! Cyndi, that is so wonderful—love that you made this a part of your “feast”!